At Ek Bar there is food with a story! True artisan food implies a deep understanding of the craft of making food. Chef Sujan has weaved his menu derived from many such traditional Indian flavors! The all new menu for Sunday Brunch at Ek Bar gives all the more reasons to visit again and savor those delicacies from the kitchen served with the in-season cocktails from the bar. One look at the menu left me drooling &the experience bowled me over! 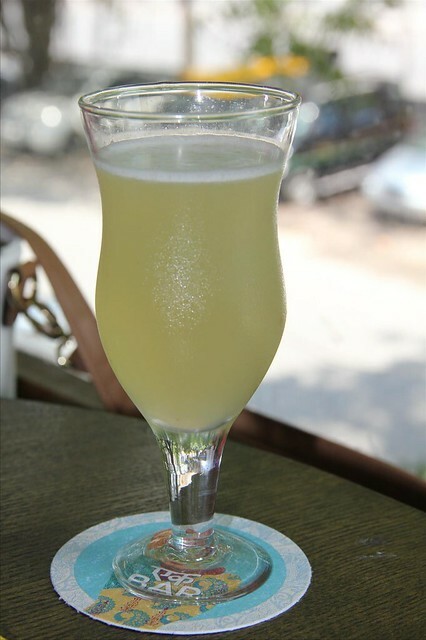 The brunch menu is composed of thalis, quarter plates (can select any 6 from them) and desserts, served with some luscious cocktail punches! Quarter plates consists of an array of selections for both vegetarians & non-vegetarians – Ek Bar Granola bar V2, Mushroom Pâté, Kataifi wrapped chilli paneer, Potato and Jalapeno Tikki chaat to name a few. 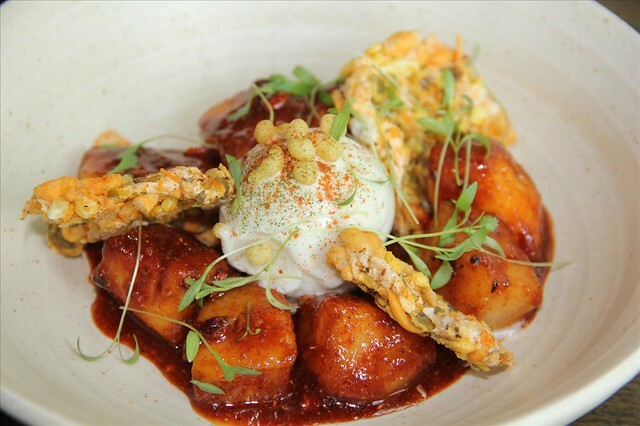 For the meat lovers there is the Andaman Tuna papdi chaat, Chicken Liver Pate, Barbeque Pork Belly, Squid and Prawn Dynamite. 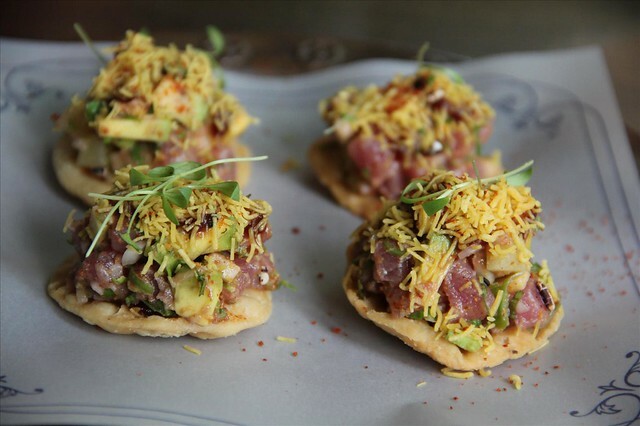 The first plate on our table was the Andaman tuna papdi chaat – a non-vegetarian avatar of the all time favorite, which continues from the old menu. 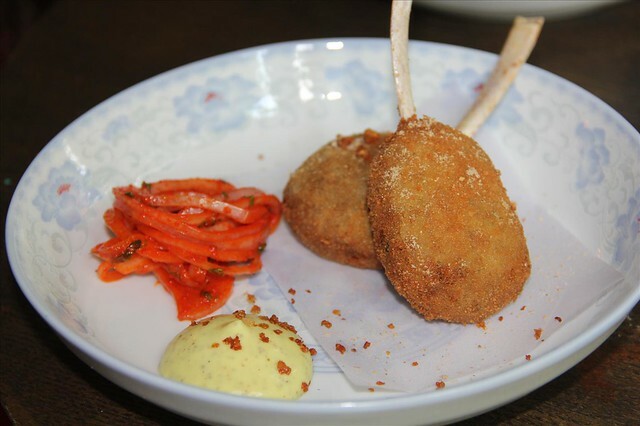 Next in line were some mutton cutlets, which were a delight to see (see the pic. below). Served with mustard mayo and spiced onion, these juicy minced mutton cutlets with a crisp outer are a treat for the eyes and palate. The Granola Bar V2 is an adaptation of the famous jhal moori from the east of India – summer fruits in hajmola marinade and that delicious buttermilk sorbet are amazing, but we felt V1 of the dish was far better in taste. 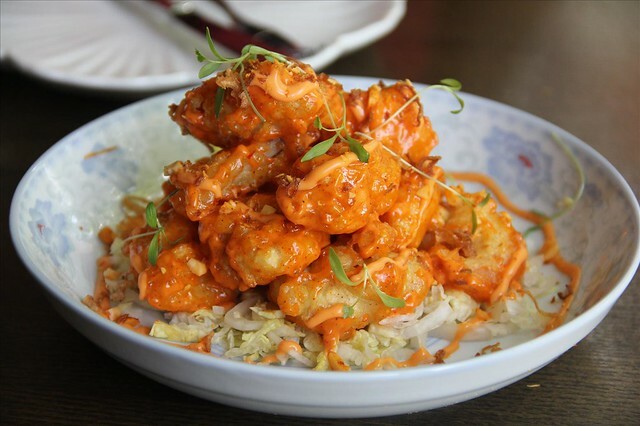 Tempura fried prawns and squids tossed in naga chili mayo is a fresh take on the golden fried prawns, served with some shredded lettuce and crushed masala peanuts, the burst of flavors is exquisite. 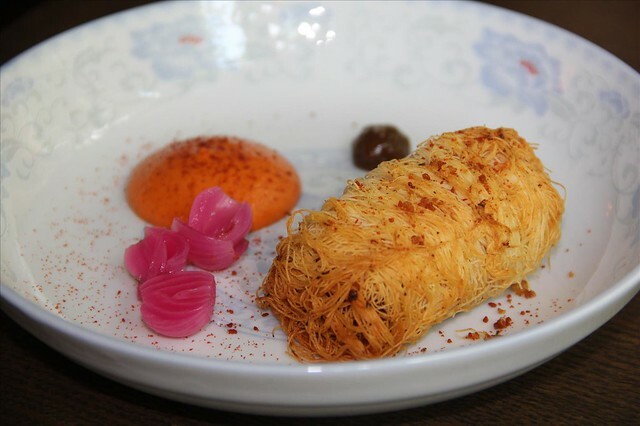 Kataifi wrap chilli paneer – golden,crispy and amazingly moist Kataifi (vermicelli like pastry rolled into cylinders) with a filling of chilli paneer takes the concept of a wrap to a different level. A must try! 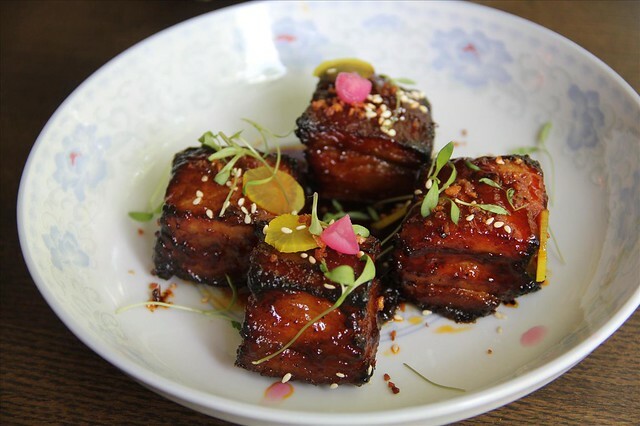 Tandoor cooked smoked pork belly with BBQ sauce is a must try if you like pork – the pork is ideal, with the crackling crisp and the inside tender. 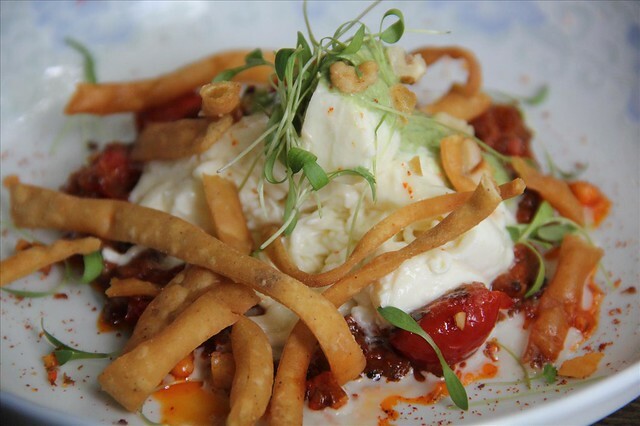 Fresh local Burrata cheese – a ball of gooey burrata cheese served on a bed of charred tomato salsa is a great dish to have. The creamy heart of burrata is a great way to change your palate after all that meat. The corn fritters add a crunch to the dish. For the desserts, we got the mango cream in filo pastry and moong dal halwa baklava with apricot ice cream. These two are currently not in the menu but take our advice and ask for them, you will thank us, like a zillion times! 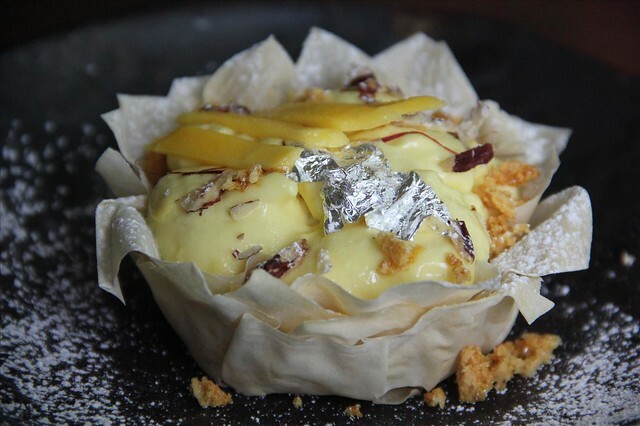 Taking inspiration from the Haji Ali fruit cream, the former has a mango overload – fresh mango cream, chunks of the fruit and a mango ice cream served within thin film sheets– this one definitely leaves you wanting for more. Moong Dal Halwa baklava is a brilliant adaptation of the classic Greek dessert. 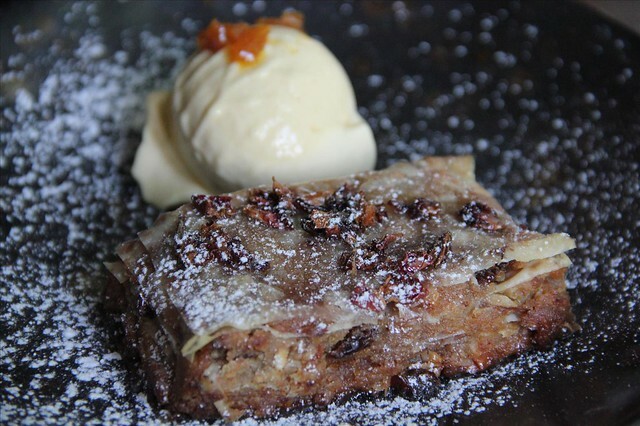 Served with in-house apricot ice cream, the dessert scores highly. The apricot ice cream is undoubtedly the best we have had in the city. It won’t be just, if I don’t mention the cocktails churned out at Ek Bar. 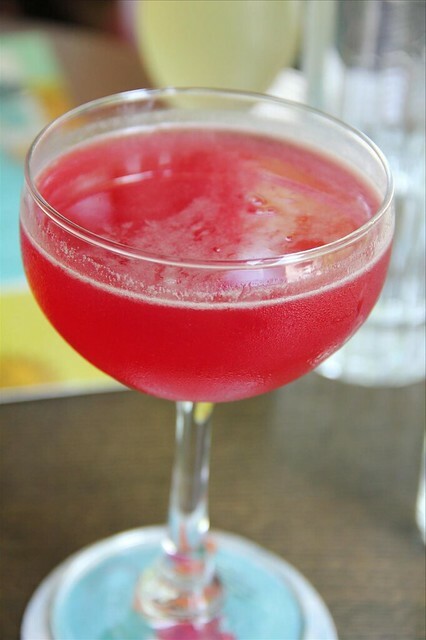 My love for cocktails here is known (read my experiences here, here & here). The new cocktails introduced with the summer menu are Susegad – with a very likeable concoction of white rum, coconut syrup and caramelized pineapple syrup; Phool Bagaan Fizz – jasmine infused gin, egg white and sugar; and Ek Bar Kanji (must try) – tequila, pickled beetroot and in-house kanji shrub – are again masterpieces curated at Ek Bar. 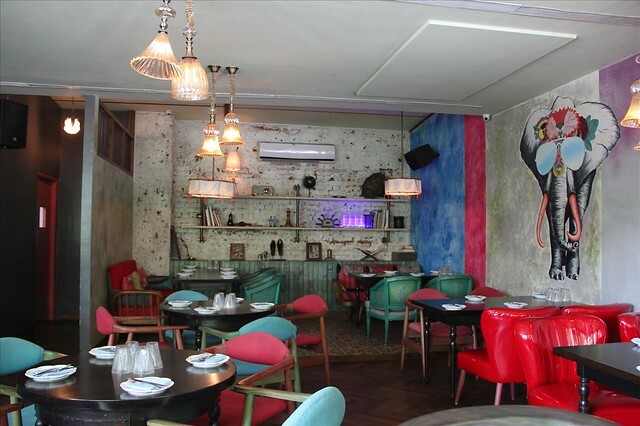 The entire experience & brunch is priced at Rs. 1700++ with alcohol and Rs. 1000++ without alcohol. Food is never just about the relishing; its much about the experiences, and at Ek Bar it’s always the best.